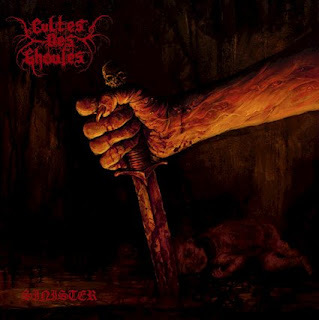 Culte des Ghoules are a band from Poland that plays an occult form of black metal and this is a review of their 2018 album "Sinister" which will be released on Halloween by Hells Headbangers. Distorted amp noises start off t he albums along with some drum beats and bass guitars a few seconds later while heavier riffs start to make their presence known a few seconds later along with the riffs also using a decent amount of dark sounding melodies and the vocals also bring in a rough yet melodic style briefly. All of the tracks are very long and epic in length while synths can also be heard briefly while the vocals also a dd in a decent amount of grim black metal screams along with the music also having its weird moments as well as some spoken word parts also being used briefly and when the music speeds up a decent amount of tremolo picking and blast beats can be heard and they also give the songs more of a raw feeling. Throughout the recording you can also hear a great mixture of slow, mid paced and fast parts while the drumming also gets very tribal and ritualistic sounding at times along with all of the tracks sounding very different from each other and at times the music also gets very experimental and avant garde sounding and as the album progresses a brief use of clean guitars can also be heard. Cultes des Ghoules plays a style of occult black metal that is very original and different sounding, the production sounds very professional while the lyrics cover devil worship, ancient rituals, witchcraft, and demonic possession themes. In my opinion Cult des Ghoules are a very great and original sounding occult black metal band and if you are looking for something very different, you should check out this album. RECOMMENDED TRACKS INCLUDE "Children Of The Moon" and "Where The Rainbow Ends". 8 out of 10.